Library image #2639: Aerial view of the coastal wetland region. The United States Congress designated the Swanquarter Wilderness (map) in 1976 and it now has a total of 8,785 acres (8784.93 acres, technically). All of this wilderness is located in North Carolina and is managed by the Fish and Wildlife Service. Established in 1932, Swanquarter National Wildlife Refuge encompasses around 16,500 acres of islands and coastal marshland on the north side of Pamlico Sound. 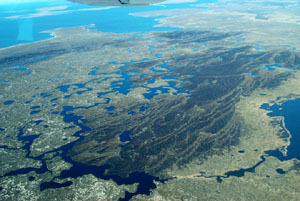 The Swanquarter Wilderness makes up more than half of the refuge: Judith Island, Swanquarter Island, Great Island, Marsh Island, and portions of the mainland along Juniper Bay. Judith, Swanquarter, and Great Islands are entirely estuarine, dominated by black needlerush, intermittently under water usually due to wind tides. Marsh Island is almost entirely estuarine, with a small upland forest section on the extreme northern boundary. Along the mainland of Juniper Bay, the Wilderness is approximately half estuarine and half upland forest. In uplands forests of loblolly pine, you may catch a glimpse of white-tailed deer, opossums, raccoons, and squirrels. Yellow-bellied turtles and water snakes inhabit the needlerush and saw grass that blankets most of the refuge, and a few of the northernmost American alligators live here in brackish water. Access to most of the Swanquarter Wilderness requires a boat. Most visitors come to fish from May through November for croaker, spot, speckled trout, flounder, puppydrum (young redfish), and bluefish. Crabbing is a popular sport in the warmer months. Portions of the refuge are open seasonally for waterfowl hunting. Planning to Visit the Swanquarter Wilderness? How to follow the seven standard Leave No Trace principles differs in different parts of the country (desert vs. Rocky Mountains). Click on any of the principles listed below to learn more about how they apply in the Swanquarter Wilderness.